The Hofburg was the original centre of the Habsburg court, where the Imperial family lived, worked and ruled(and ate remarkably expensive dinners). 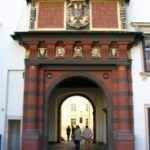 Today, this collection of buildings and open spaces serves a variety of purposes, from the President’s offices to the National Library and the Spanish riding school. 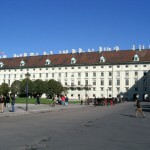 The Spanish Riding School: the visitor centre and arena is opposite the winter palace entrance. 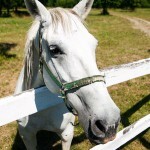 Explore the history and learn how to see the horses in action. 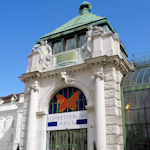 The Schatzkammer: the Imperial Treasury is a standalone part of the Kunsthistorisches Museum, featuring the crown jewels, religious relics and similar collected by the Habsburgs. 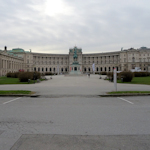 The Neue Burg: an extensive palace wing and home to the National Library, Ephesos Museum, Weltmuseum, the House of Austrian History, and two important collections: Arms & Armour, and Historical Musical Instruments. 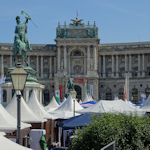 Heldenplatz: the huge square in front of the Neue Burg, featuring the monument to Prinz Eugen von Savoyen, great views of the Neue Burg, and often hosting events like the harvest festival or Waldviertelpur. Burggarten: a park area behind the Neue Burg where you’ll also find the Imperial butterfly house and palm house (not to be confused with the one in the Schönbrunn gardens).